Nearly ten pounds of methamphetamine was seized from a Canadian man crossing the Blue Water Bridge earlier this week. 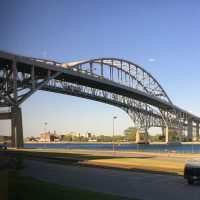 According to U.S. Customs and Border Protection Officers in Port Huron, the suspect attempted to enter the United States Wednesday morning and was deferred to secondary inspection after a passenger in the vehicle was unable to provide proof of citizenship. During inspection, authorities found and seized nearly ten pounds of methamphetamine tablets that were in the vehicle. The suspect, Constantine Xethalis, is facing multiple charges including importing controlled substances and procession with intent to deliver.